Do you crave barista-quality froth or perhaps you’d like to make a London Fog with freshly brewed tea? Milk frothers are a key piece of equipment for cafe quality beverages. Well, now your favorite cafe can be inside your home every single day when you add a milk frother to your list of coffee equipment. Now one could create a delicate foam for homemade lattes, cappuccinos, or even hot chocolates. Buying the right milk frother however can be tricky as they all seem to do the same thing right? They all simply agitate milk. There are of course some differences in how they operate and their build quality so we wanted to make this buyers guide to help our readers. 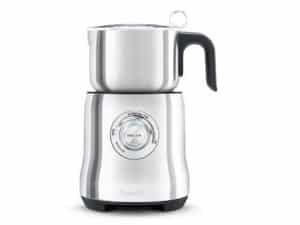 Breville is a company that is respected in creating domestic appliances but also known for their dedication to coffee-crafting gear as well. Thier frother is the only one on the market that allows the user to set both the temperature of your milk and the amount of foam you wish to create simultaneously using the circular dial found on the side of the apparatus. The Breville BMF600XL Milk Café also gives you the ability to create enough foam for up to three big cups of coffee with its huge capacity, and the foam control is The Breville comes with two interchangeable frothing disks. The first one is used to create smooth latte micro-foam and the other for a dense cappuccino foam. Made from a striking stainless steel design, which is also dishwasher safe. Since the size of bubbles you’re putting into the drink greatly affect the end result, it’s worthwhile to have two options to make whatever drink you’re looking for. The Milk Cafe uses induction heating and turns itself off once the desired temperature has been reached to deliver perfectly steamed or frothed milk every time. In terms of value and its ability to create a nice dense foam, the Nespresso AeroccinoPlus is a fantastic addition to your kitchen. A jug style frother, this using centrifugal force inside the Aeroccino to create a froth with your already pre-made beverage. Many prefer this style over the wand as it feels more authentic to what one might experience in the cafe. That’s for you to decide, however, this jug frother has a heating element which will help keep your beverage warm in the process. 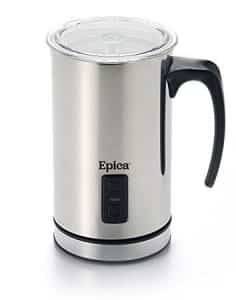 The Epica uses a motorized whisk that attaches to the bottom of the jug to create foam. Further, it only has one whisk attachment that creates dense cappuccino foam. Often, milk frothers leave a milk crust at the bottom of the jug so it’s essential to clean it after each use, so not to the effect the taste of the next batch of foam. Another difference that favors this Epica milk frother is that it’s easier to choose between cold or hot frothing as it has two distinct buttons – I think that’s a bit more user-friendly. Though Kuissential is known mostly for dining wares, this milk frother creates a creamy, perfect froth. 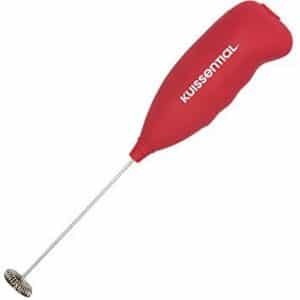 This is a durable handheld milk frother that features durability, ease of use, and frothing capabilities. The SlickFroth 2.0 comes out on top for those points. Cleaning up after use is as easy as running your SlickFroth in hot soapy water and rinsing. Simply load it with batteries and froth in a tall canister. 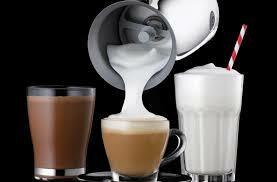 Now you’re able to froth any milk of your choices and make refreshing and warming drinks in a flash. The MatchaDNA Milk Foamer quickly garners foam in seconds with its impressive workflow. This allows you to create fluffy and aerated milk-based drinks hot or cold. Handheld, battery operated with no chord to impede you, this is an easy to clean Milk Frother with ease of operation at the forefront. Need frothy foam in seconds? Aerate milk-based drinks even add a little cinnamon and or honey added to prepare a comforting before-bed treat. A stainless steel shaft and whip adorn the mixer. The Matcha DNA handheld electric milk frothers are very easy to use, you might trick friends into thinking you’re a professional barista. Keep in mind that hot chocolate is vastly better when it’s prepared with foamy milk rather than water. Not all Milk Frothers are created equal. 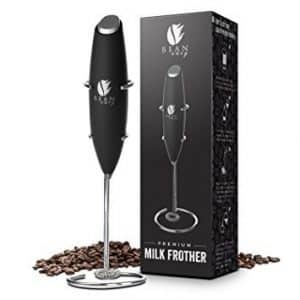 Bean Envy’s electric handheld Milk Frother wand is a beautiful addition to the kitchen with a seriously impressive functionality. This wand style frother is not only ergonomically sound, but it’s elegant and stylish as well. Constructed to last, is made of rust-resistant stainless steel. Additionally, it’s run by a powerful 19,000 rpm motor that is surprisingly quiet. If you’ve gone with the wand style frother over the jug then here’s some insight into the process. This is quite a handy device if you’re looking to make crafty beverages at home. 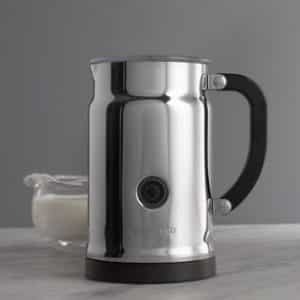 To get a proper milk froth with your chosen piece of gear from our list, first, pour the milk into the jar or canister. Fill your canister with as much milk as you normally use in your coffee, but no more than half full so there’s room to make some foam. Then blend with the wand of the frother until the milk is frothy and has roughly doubled in volume, 30 to 60 seconds. It also can be used to mix hot or cold drinks, blend your favorite cocktail, or even whip eggs. Often milk frothers are not dishwasher safe and have to be rinsed after each use to maintain it, as a layer of crust can build up on the bottom of the frame. So do your due diligence to clean them. If you’re impressed at what these milk frother can do to your home coffee process, then you should peruse our coffee gear and get some ideas about what to add next.